Shafieirad, A., Arefpour, A., Monshi, A., Saidi, A. (2016). The Influence of Hematite on High Speed Continuous Casting of Steel Lubricating Powders: Viscosity and Crystallization. International Journal of Iron & Steel Society of Iran, 13(1), 20-26. A. Shafieirad; A. Arefpour; A. Monshi; A. Saidi. "The Influence of Hematite on High Speed Continuous Casting of Steel Lubricating Powders: Viscosity and Crystallization". 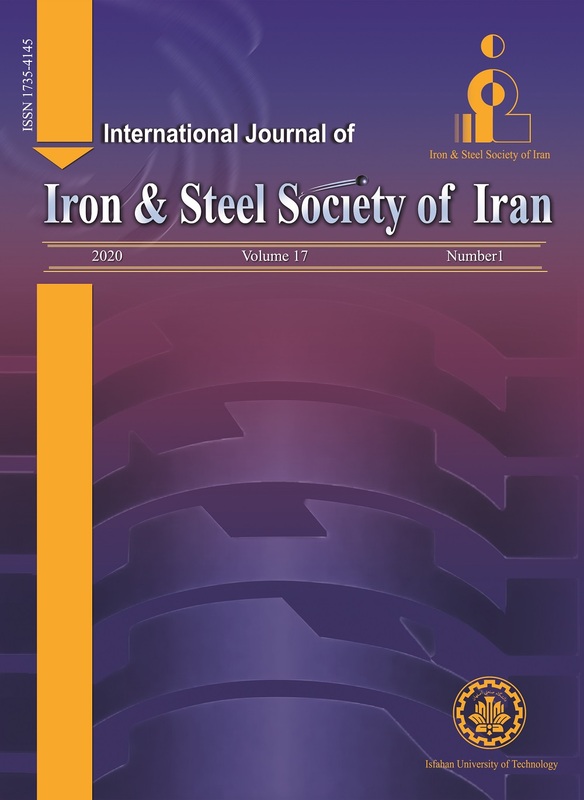 International Journal of Iron & Steel Society of Iran, 13, 1, 2016, 20-26. Shafieirad, A., Arefpour, A., Monshi, A., Saidi, A. (2016). 'The Influence of Hematite on High Speed Continuous Casting of Steel Lubricating Powders: Viscosity and Crystallization', International Journal of Iron & Steel Society of Iran, 13(1), pp. 20-26. Shafieirad, A., Arefpour, A., Monshi, A., Saidi, A. The Influence of Hematite on High Speed Continuous Casting of Steel Lubricating Powders: Viscosity and Crystallization. International Journal of Iron & Steel Society of Iran, 2016; 13(1): 20-26. Mold powders used in the continuous casting of steel contain the harmful CaF2 as a main substance developing toxic gases such as SiF4 and HF at elevated temperatures. In this study, three samples of I1, I2 and I3, which contained gypsum free Portland cement clinker with different percentages of Fe2O3 (5.68, 6.83, 8.02 ) and F- (2.09, 1.06, 0), were prepared and their main characteristics were compared with those of the standard and the molten reference powder. The results showed similarity in viscosity between samples I1, I2 and the molten reference powder, which was desired. Sample I3 with no fluorine showed a higher viscosity in comparison to the standard sample and therefore, a complete replacement of CaF2 with Fe2O3 could not be recommended. Furthermore, the XRD of the reference powder, molten reference powder and sample I2, the SEM of the molten reference powder and sample I2 and EDS of sample I2 analyses were also performed. The XRD patterns results demonstrated that by decreasing CaF2, cuspidine phase was vanished, while other crystalline phases such as gehlenite, fayalite, akermanite, nepheline and Mn3O4 were found. In addition, SEM micrographs and EDS analysis of sample I2 in the white area revealed crystalline particles in the glass matrix. Considering EDS analysis of sample I2 showed the existence of Mg, Na, Mn, Fe, Si, Al and O. It could be concluded that such crystals as gehlenite, akermanite, nepheline and fayalite were composed in the glass matrix, developing to similar heating properties in the glassy matrix. W. Wang, K. Blazek and A. Cramb: Metal. Mat. Trans. B., 39B (2008), 66. S. Y. Choi, D. H. Lee, D. W. Shin, S.Y. Choi, J. W. Cho, J. M. Park: J. Non-Crystalline Solids., 345(2004), 157. G. Wen, S. Sridhar, P. Tang, X. Qi and Y. Liu: ISIJ Int., (2007), 1117. South African Institute of Mining and Metallurgy, (2004), 713. M. Persson, M. Gornerup, S. Seetharaman: ISIJ Int., 47(2007), 1533. M. Hayashi, T. Watanabe, H. Nakada, K. Nagata: ISIJ Int., 46(2006), 1805. K. C. Mills, A. B. Fox and M. C. Bezerra: in MMT 2000, (2000). M. Hayashi, R. A. Abas, S. Seetharaman: ISIJ Int.,44(2004), 691. A., Cruz, F., Chavez, A., Romero, E., Palacios, V., Arredondo: J. Mater. Proces. Technol., 182(2007), 358. M. Hanao, M. Kawamoto, T. Watanabe: ISIJ Int., 44(2004), 827. K. C. Mills: EUR. 13177 ECSC., Luxembourg., (1991). A. B., Fox, K. C., Mills, D., Lever, C., Bezerra, C., Valadares, I., Unamuno, J.J., Laraudogoitia and J.,Gisby: ISIJ Int., 45 (2005), 1051. J. Moore, R. Phillips and T. Gibbs: Proceeding of ISS 94th Steelmaking Conf., (1991), 615.